Peppers and apricotts are filled with vitamins that will help you fight off or prevent a summer cold. 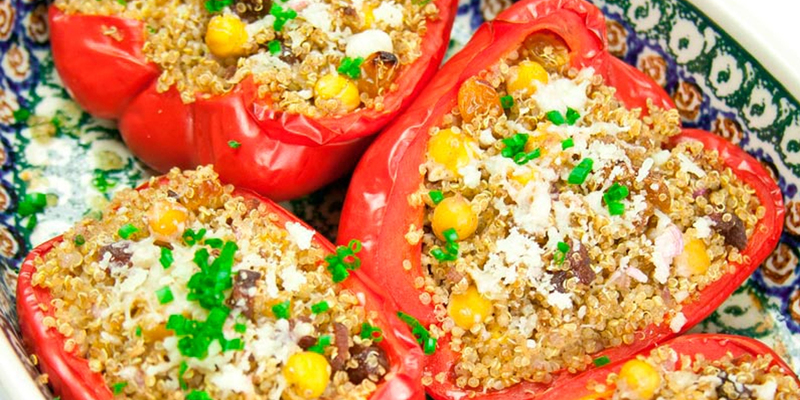 Place the quinoa, 1 1/4 cups water and sea salt in a sauce pan, cover and bring to a boil. Blanch the pepper halves for 2 to 3 minutes. Remove, drain and set aside. Heat oil in a skillet. Sauté the garlic and onions for 1 minute. Add the raisins, apricots, beans, cinnamon, cumin and shoyu. Sauté another 2 minutes. Combine with the quinoa and mix thoroughly. Place in an oiled baking dish with a little water. Bake for 20 minutes or until peppers are tender. Sprinkle parmesan on top of each pepper halve and bake another 5 minutes.